Bottle deposit laws, policy that requires the containers for carbonated beverages such as soft drinks and beer to carry a refundable deposit, have been a subject of controversy for more than thirty years. Designed to reduce waste by motivating more people to recycle bottles and cans, the strategy imposes a mandatory fee of usually five or ten cents per container that consumers pay at the cash register; when customers return the containers to stores selling the product or redemption centers, they get their deposit back. Since the concept was introduced in 1971 by Thomas Lawson McCall, then governor of the state of Oregon, the beverage industry has fought such legislation. Environmentalists and the recycling industry, however, have hailed the strategy as a major success. Organizations such as the Grocery Manufacturers of America (GMA) argue that the system is outdated, unnecessary, and inefficient. The program was introduced, they say, during a time when recycling was just beginning to catch on, whereas today, curbside recycling programs, which focus on broad categories of materials such as plastics, or glass, instead of product-specific containers such as milk jugs or soda bottles, are flourishing. Additionally, they argue, deposit laws require a vast, costly infrastructure to track collections and payments; sort containers by material, brand, and distributor; and transport collections between stores and processing centers. For such little gain, such critics say, the benefits of the laws hardly seem worth it when compared to their costs. But according to one report released by Business and Environmentalists Allied for Recycling (BEAR), an alliance of businesses, recyclers, and environmentalists that studies recycling recovery rates, deposit programs achieve the highest levels of recycling. The eleven states that currently have bottle deposit laws (see table) recycle more waste than all other U.S. states combined, with each state reducing overall litter by 30 to 47 percent. Let the facts, recycling proponents argue, speak for themselves. Some states are calling for an expansion of bottle deposit policy to include the containers for noncarbonated beverages such as juice, bottled water, and milk; Iowa, Maine, and Vermont currently include wine and liquor bottles in their state laws. 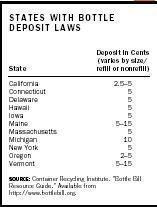 In 2001 Maine even proposed a deposit on cigarettes, the leading litter item on Earth. SEE ALSO R ECYCLING ; S OLID W ASTE . Beck, R.W. et al. (2002). "Understanding Beverage Container Recycling: A Value Chain Assessment." Business and Environmentalists Allied for Recycling (BEAR). Available from http://www.container-recycling.org/BEARRpt.html . Container Recycling Institute. "Bottle Bill Resource Guide." Available from http://www.bottlebill.org . Grocery Manufacturers of America. "Beverage Container Deposits." Available from http://www.gmabrands.com/publicpolicy . SOURCE: Container Recycling Institute. "Bottle Bill Resource Guide." Available from http://www.bottlebill.org .